Voices of the Village band members Rachel Matteson, left, and Jerry Vanney, center, and band director Jon Dalgarn sing at the Village Community Services' annual gala on April 6. Local nonprofit Village Community Services held their 12th annual Village Gala on April 6 and gave a special screening of the upcoming Voices of the Village documentary. 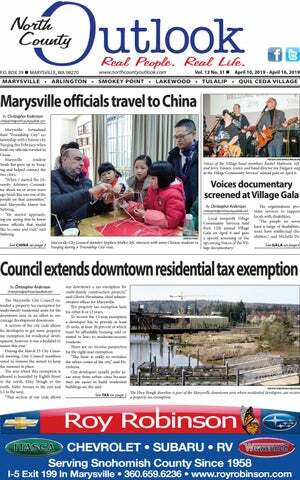 our downtown a tax exemption for multi-family construction projects,” said Gloria Hirashima, chief administrative officer for Marysville. The property tax exemption lasts for either 8 or 12 years. To receive the 12-year exemption a developer has to provide at least 20 units, at least 20 percent of which must be affordable housing sold or rented to low- to moderate-income residents. There are no income parameters for the eight-year exemption. “The basis is really to revitalize the urban center of the city,” said Hirashima. City developers usually prefer areas away from urban cores because they are easier to build residential buildings on, she said. The Ebey Slough shoreline is part of the Marysville downtown area where residential developers can receive See TAX on page 3 a property tax exemption. During two visits Marysville gave Chinese officials a tour of their ArlingtonMarysville Manufacturing Industrial Center and the city’s wastewater treatment plant. Officials from the two cities began talking about a “Friendship City” relationship during those meetings, which is roughly equivalent to a “Sister City.” This year Nehring and two Marysville City Council members traveled to Yueqing for the first time. “The actual documents and codification of the whole thing came together with this trip,” he said. None of the trip was paid for with city funds. “We paid for everything out of pocket,” said Nehring. “Even though about half the trip was in Yueqing for city business we just thought it would be cleaner that way." Nehring said they learned a lot on the trip. “China and Asia have always been a little bit mysterious to me. I know a lot about Europe, my wife is from Europe, but not much about Asia,” he said. Yueqing is a much bigger city than Marysville. “Their city is a mid-sized Chinese city of 2.7 million people,” said Marysville City Council member Mark James, who went on the trip. I feel like we got a massive education on their culture and they learned about the U.S. as well. out gifts to the kids as well. “We were able to gift them some of the friendship pins and their faces just lit up,” said Renae James. “The kids each gave us a poem too. We needed an interpreter, of course, to know what they said, but it was lovely,” she said. Nehring said that giftgiving seemed to be very much a part of Chinese culture. “We had other gifts for the city, but to have something to give to the kids was important,” he said. He said he was happy with the trip and looks forward to a continued relationship with Yueqing officials. “I feel like we got a massive education on their culture and they learned about the U.S. as well,” he said. We said that if we hit 10 to 12 kids each day that would be a success and we've hit around 55 kids every day. would be a success and we’ve hit around 55 kids every day,” said Brown. Jeff Sowards, co-coach of the Lakewood High School track team, said that his students enjoyed coming out to the lunches. “I think this is an awesome idea and it kind of worked out that the track team’s practice got done when they’re starting here,” he said. “The services that they are going to provide are pretty amazing for our community as well." Lakewood student Sean Spencer said he enjoyed coming out to the church for the lunches. “I think that this is a great thing. It’s nice for us to hang out and there’s a lot of stuff to do,” he said. Brown said that many of the students came out for the full time to play games after their lunch was done. The lunches themselves are meant to help fill the gap where student school lunches normally would be. emption is allowed is zoned for mixed use. Hirashima noted that doesn’t necessarily mean the classic city setup of “retail on the bottom floor, apartments above,” but could just mean commercial/retail space in a separate building set aside. Although a developer can choose to include that kind of space, a property does not have to include retail/commercial space to be eligible for the property tax exemption. The city owns shoreline property that was previously used by industry and has a more active say in how that will be used. “We’ll have direct control of what uses would go into that property,” said Hirashima. “If we want to see a mixed-use type of building there the city can require it." and get a mental health clinician here that kids could access for low-cost or for free,” he said. More information about the church is available at flclakewood.org. SHOP AND KEEP MORE OF YOUR MONEY IN YOUR POCKET! Coastal is paying the Sales Tax for you on all your purchases this Saturday. Restrictions may apply. With coupon only. Not valid with other offers. Ron Whitley eats lunch with his niece Lilly Davidson during one of the lunches provided by the Faith Lutheran Church of Lakewood during spring break on April 3. BUY 3 TIRES, GET THE 4TH FREE! Veento & Hankook tires only. With coupon. Not valid with other offers. went a perfect 2-2 with two runs, two RBIs, one stolen base and two singles. If you want to come out and support the Eagles their next home game will be against the Snohomish Panthers on Tuesday, April 16, at 4 p.m.
Matches begin at 7:30 p.m.
Matches begin at 3 p.m. Match begins at 3 p.m. Meets begin at 3:30 p.m.
April 13	East Valley	Home	MLHS* April 13	Moses Lake	Away	MLHS** April 15	Arlington	Home	M-PHS *Game begins at 12:45 p.m. **Game begins at 2:15 p.m. Match begins at 7 p.m.
Arlington Eagles Matches begin at 3:30 p.m.
Games begins at 4 p.m.
April 10	Burlington-Edison	Away	BEHS* April 12	Sehome	Home	LWHS April 15	Squalicum	Away	SqualHS** *Match begins at 3:45 p.m. **Match begins at 4 p.m. Match begin at 3 p.m.
Game begins at 4:30 p.m.
April 10	Burlington-Edison	April 12	Sehome	April 15	Anacortes	*Game begins at 6 :45 p.m.
Matches begin at 7 p.m.
April 11	Burlington-Edison	April 13	Sehome	April 16	Anacortes	*Match begins at 2 p.m.
on three plate appearances while putting up one RBI, one single and one double. The Chargers senior duo of Caleb Koellmer and Ryan King also put in some work of their own. Koellmer, first baseman, finished with two hits out of four appearances, one run, two RBIs, one stolen base, one single and one double. King, right fielder, went 2-3 at the plate with two runs, one stolen base and two singles. If you want to catch the Chargers' next home game, they will be playing the Everett Seagulls on Tuesday, April 16, at 4 p.m.
Cider is a 6 year old female Domestic Shorthair mix. Cider is a cute, shy feline that will need a quiet, adult only home. All the recent changes in her life have left her insecure, so a patient family willing to give her lots of time to come out of her slowly come our of her shell and build her confidence is recommended. You can meet with Cider at The NOAH Center today. THINKING ABOUT SELLING YOUR HOME OR LAND? FREE CONSULTATION NO OBLIGATION Questions on how to get started? Need market value? Contact me today! Chargers’ sophomore outfielder Kody Galde races to second base as he earns the steal against the Stanwood Spartans at Marysville-Pilchuck High School on April 3. Colby Watts, Chargers’ senior third baseman, fields the grounder and records the out at first against the Stanwood Spartans at Marysville-Pilchuck High School on April 3. Kyle Matson, Tomahawks’ senior forward, uses his speed to stay ahead of the Hawks’ defense as he takes a shot at the goal at Marysville-Pilchuck High School on April 1.
over Mountlake Terrace. Mountlake Terrace came out in the second half with more energy on the offensive end, but the Tomahawks' defense continued to shut them down. Multiple defensive stops contributed to a transition score in the 61st minute for Marysville-Pilchuck’s third goal of the night. The Tomahawks stayed aggressive from beginning to end as they totaled 22 shots-on-goal and secured the 3-0 shutout victory over the Hawks. “It’s nice when we are able to expand players' roles so that we can use them in different spots later in the season. Every day they come out and practice how they play. They are intense and they know that when you are out on the field you have to be ready to go,” said Marysville-Pilchuck Head Coach Paul Bartley. Marysville-Pilchuck was led by their seniors Randy Galvan, Kyle Matson and Eric Ibanez. Galvan, forward, scored the first and third goal for the Tomahawks as he has notched a total of seven goals on the season. Matson, forward, accounted for the second goal against the Hawks as he has scored a total of six goals so far this year. Ibanez, goalkeeper, recorded eight saves on the night while also putting up his fifth clean sheet of the season behind a strong defense. If you want to come out and cheer for the Tomahawks, their next home match will be against the Marysville Getchell Chargers on Tuesday, April 23, at 7:30 p.m. Source: Mobile Geographics LLC NOT FOR NAVIGATION North County Outlook assumes no liability for damages arising from the use of these predictions. They are not certified to be correct, and they do not incorporate the effects of tropical storms, El Nino, seismic events, continental drift or changes in global sea level. early so they can get parked and get ready before we go because we start at exactly 11 a.m.” said Lopez. The city has prepared about 10,000 eggs for children to collect at the event, either filled with candy or prizes like a Walmart gift card or an arts basket from the Arlington Arts Council. The Easter Bunny will also be available for family pictures before and after the egg hunt. Volunteers from Youth Dynamics help run the event and the Arlington United Church will serve some light refreshments as well. Cars should enter the parking area from 51st Avenue around 172nd Street, said Lopez. Marysville Easter Egg Hunt Children age 0 to 8 can come to the Marysville Easter Egg hunt on April 20 from 10 a.m. to 11 a.m. at Jennings Park. The format is the same as previous years, with children getting a maximum of eight eggs each and without all of the kids being released to hunt at once. The city has prepared about 13,000 eggs this year, according to Jim Ballew, director of the Marysville’s Parks, Culture and Recreation Department. “We feel like we have a great venue,” he said. Much of the hunting will again take place in the Jennings Park master garden. “We are generally surprised at how many people turn out,” he said, “it seems like a primary stop for many families' holidays.” Activities like face painting and meeting the Easter Bunny will also be available at the event. “There’s a lot of things to do, it’s not just a traditional Easter egg hunt,” said Ballew. The event is free, but donations to the Marysville Community Food Bank are collected. “We ask people to bring a canned food item to help with those efforts,” said Ballew. Ballew also asks that families leave their dogs at home for the event. The event is also supported by the local Rotary club who are a big part of making it happen, said Ballew. Arlington Assembly Easter Egg Hunt Arlington Assembly will hold their annual egg hunt at Arlington’s Presidents Elementary from noon to 2 p.m. on April 13. They plan to have 15,000 eggs to hunt. Each egg hunt is divided by age brackets and they are staggered throughout the event. “We start with the youngest group,” said Taunya Sanchez, children’s director at the church. “That gives everyone an opportunity to get their kids out there." Food from Stick It or Stuff It will be available, as well as games and activities. The local church has offered the egg hunt for many years. velopmental disabilities, you might be a little apprehensive, but once you see them in this environment you just chill," he said. Since 2017 Village Community Services has been working on a documentary about the band which held a screening at the recent gala, the first time the public is getting a peek at the movie. "This screening is exclusive to this gala and then it's going to go into some fine tuning," said Elena Haas, producer and director of the film. Haas has taught acting classes for those with disabilities and said that she and her team has a "heart for this kind of work." "I love getting to know the people that are backing it and the band is amazing," she said. She said that arts programs can make a huge difference in getting those with disabilities involved in the community. "I know what kind of difference it makes when you give them a chance to express themselves and participate," she said. After working with the band for a couple of years she said she still enjoys working with them. "I like it more and more. Sometimes I forget how exciting it is to be at their concerts," she said. Village Community Service's gala held a live auction this year again, including items like a three-night trip to Lake Tahoe. "We usually make around $30,000 and we're hoping for $40,000 tonight," said Dietz. More updates about the video is available at their Facebook page at www.facebook.com/VoicesoftheVillageDocumentary. More information about Village Community Services is available at villagecommunitysvcs.org. etz, executive director of Village Community Services. "We help people to find and keep jobs and we also help them live as independently as possible in their own homes," she said. The services the organizations provide are important for families who often lack support to help children with disabilities. "Many moms leave employment to take care of their adult child with disabilities," said Dietz. In addition to helping the family, Village Community Services is able to provide some way for those with disabilities to connect. Celebrate Earth Day in Marysville April 27 June 21. The last day will be at Jennings Park a shortened day. They were also approved for a waiver for the final two days they had to make up, said Runyon. The district had to still meet the instructional hours though, and to do that they are making most Fridays full school days, instead of the shortened days that are normal for the school district. To makeup more days would require the students to go to class far into the summer. “We did not want students still in school at the end of June or the first week of July,” said Runyon, as families and staff often have planned vacations for those times. If those piles of paperwork at home aren't sparking joy, channel your inner Marie Kondo and release them at the free Shred-AThon event on Saturday, May 18, between 9 a.m. and noon, at Marysville City Hall, 1049 State Ave. Please don't arrive early. People who arrive after 9:15 a.m. are served most quickly. For information about what will be, and what won't be accepted, go to the city's website at https:// www.marysvillewa.gov/civicalerts.aspx?aid=573. Donations to Marysville Community Food Bank gratefully accepted. The only free local community paper that’s delivered ­direct to your mailbox every week. Locally owned, locally managed. Greater Marysville Artists Guild member Rod Sylvester with some of his art at a recent open house put on by the organization on April 3.
have really become important to me.” There is a great variety in the art and artists in the group as well, said Stump, ranging from natural paintings to the more surreal. She said that one of their members has “a lot of funny hilarious stuff, a lot of it has dinosaurs or trains in it.” Some of the members just paint for themselves while others bring their art out for many different types of events. “We have one artist, she shows at the rodeos and fairs all over, not just in the state,” said Stump. The Greater Marysville Artists Guild has been a part of the area for a few decades now. “I joined 25 years ago and it was an established organization back then,” said Stump. “We used to be 50 or more people,” she said. “People forget that we’re here." Stump invites anyone who wants to be a member to come to a meeting. “It’s a fun thing and everyone is welcome,” she said. Meetings for the organization are the first Wednesday of the month, March through November. “And that’s so old people don’t have to drive in snow and ice and dark,” she said. There are $25 dues, $5 of which goes toward the scholarships the organization provides. For more information contact Stump at sheila.a.stump@gmail.com or at 425-524-6200. Share your news! Help us tell your neighbors about club activities, fundraising events, meeting schedules and more. Send your information to North County Outlook, P.O. Box 39, Marysville, WA 98270 or e-mail the information to: editor@northcounty-outlook.com. tant to make sure that our constituents are informed about the actions that their government is taking. This is why I continue to write columns and monthly newsletters to share information about how I represent North County residents on the County Council. That being said, civic engagement is a two-way street. When you show up, you can make a difference. So I encourage constituents to show up to our meetings, reach out to our office, and make their voices heard. If you are ready to take it a step further, there are opportunities to sit on boards and commissions at the county and city level. These citizen boards make policy recommendations to staff and elected officials. Snohomish County’s boards and commissions application can be found at https://snohomishcountywa.gov/3339/Apply. Nate Nehring is a member of the Snohomish County Council and represents District 1 which includes Arlington, Darrington, Granite Falls, Marysville, Stanwood, and unincorporated north county. He can be reached by email at Nate. Nehring@snoco.org or by phone at (425) 388-3494. Our Favorite Quotes "Life is eternal; and love is immortal; and death is only a horizon; and a horizon is nothing save the limit of our sight." Author ­— Rossiter W. Raymond Submitted by North County Outlook editor Scott Frank. Marysville Fire District area will be deciding on forming an Regional Fire Authority. Once you have completed your ballot, you can drop it off at one of the drop boxes near the Arlington Library, behind Marysville's City Hall, or in Smokey Point. Please complete your ballot and vote. RAVE: I know it's early in a long season, but it's great to see the Seattle Mariners with the best overall record in Major League Baseball. I know it won't last, but we should enjoy it while we can. Library, 135 N. Washington Ave.
10, beginning at 3 p.m., at the Arlington Library, 135 N. Washington Ave.
29, beginning at 10:30 a.m., at the Arlington Library, 135 N. Washington Ave. DONATE YOUR CAR TO CHARITY. Receive maximum value of write off for your taxes. Running or not! All conditions accepted. Free pickup. Call for details, 855635-4229. STILL PAYING TOO much for your MEDICATION? Save up to 90% on RX refill! Order today and receive free shipping on 1st order - prescription required. Call 1-866-6856901. WASHINGTON DIVORCE-SEPARATION, $130. $175 with children. NO COURT APPEARANCES. Includes property, bills, custody, support. Complete preparation of documents. Legal Alternatives, 503-772-5295. www.paralegalalternatives.com. 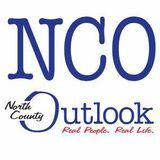 www.northcountyoutlook.com May 10, at the MarysvillePilchuck High School Auditorium, 5611 108th St. NE. The talent show is scheduled for 6:30 p.m. Thursday, June 13,during Strawberry Festival Week. The festival organizer is looking for contestants of all ages, solo, or groups in Vocal, Dance, Comedy, Bands, Musical Instruments and other categories. Deadline to enter is May 3. Visit the website at http:/www.maryfest.org and download the application and send it to Director Marcy Giesler 10121 Shoultes Rd. Marysville, WA 98270 Call 360-6536584 if you have any questions. Classified: Auctions HUGHSON TRUCKING INC. Unreserved Auction. Milk River & Sexsmith AB. Truck Tractors, Super B Grain Trailers, Construction Equipment, Pickups. Thurs., Apr. 25, 10 am. www.ClubBid.com. Your classified ad runs in our print edition (published Wednesdays) and at www.northcountyoutlook.com for one low price! The City reserves the right to reject any and all proposals, to waive technical defects, and to select the proposal(s) deemed most advantageous to the City. Volunteers for Animal Care Wanted: The NOAH Center in Stanwood is looking for volunteers. NOAH offers several volunteer opportunities to help care for their adoptable animals. If you are interested in volunteering you can go to their website at www.thenoahcenter.org or call 360-6297055. Flat Rate: 50¢ per word covers print and online publication. Deadlines: Friday 5 PM the week before publication. 'Ready, Set, Build!' returns to Marysville The Marysville Opera House is hosting the Lego-themed event By Christopher Andersson christopher@northcountyoutlook.com The city of Marysville will bring back a Lego-themed day out for kids for the second year to the Marysville Opera House with ‘Ready, Set, Build!’ on April 14. More than 10,000 Lego brick and Duplo bricks will be available for kids to build with and professional brick builder Dan Parker will be displaying his creations as well for the event. “We set up all of the stations on both the main floor and the balcony,” said Lauren Woodmansee, cultural arts supervisor with the Marysville Parks, Culture and Recreation Department. There are places where kids can build what they want and other places where they’re encouraged to help build something. “Some of the stations have projects already started that the kids can join in, like a castle or a space ship,” said Woodmansee. There are stations appropriate for kids 3 to 12, said Woodmansee. “There is a section for the smaller children,” she said. “We have tons of Duplo bricks, the larger bricks, which allow the smaller kids to create things too,” she said. Dan Parker, of brickabledesigns.com, will display many of his items during the day. “He brings several very large creations, which are two to six feet tall,” said Woodmansee. ing from 12:30 p.m. to 2:30 p.m. or from 3 p.m. to 5 p.m. Tickets are $6 and one adult may enter free with a child. Children must be accompanied by an adult. Woodmansee said that the event sold out last year so she recommends pre-registering for the event at marysvillewa.gov. Talk to the people who build your mattress! Mention this ad for 25% off one item of your choice! Reliable Ron’s Landscape Service, Etc. (except maybe those obnoxious robins that start in as early as 4 am), and picnics to be had. Spring is full of so much promise, how could anyone not be excited about life and all that it holds for us. My heart often grieves for those individuals that only see gardening as work. If only they would slow down and look a little closer at the magic that is right under their noses. My hope for this season is that all of us, as fellow gardeners, might find the time to reach out to these people and open their eyes to the awesomeness of spring. Like my wife and I, it will surely put a smile on their faces and who knows, it might even make the world just a little bit nicer. Steve Smith is the owner of Sunnyside Nursery in Marysville, and can be reached at info@sunnysidenursery.net.